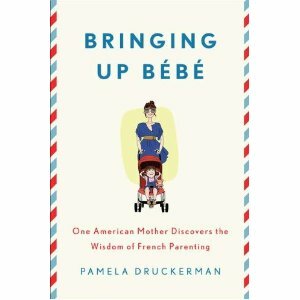 I just finished reading the book, Bringing Up Bebe, by Pamela Druckerman. It was great! Obviously, I don't believe that EVERY french parent instills impeccable manners in their children, or that EVERY American parent lets their kid eat chicken fingers for every meal, but overall the book was entertaining. It made me think about what traits I really want Soren to have, and which ones are nice, but not a necessity. The part of french parenting that I most agree with is the idea that parents have their own lives, separate from their roles as parents. French women put time and effort into the people they were pre-baby, which is difficult to do sometimes. It's nice for me that a lot of my friends don't have kids yet, because when I go out with them we typically don't spend all our time talking about babies. That said, I love hanging out with my 'mom' friends, whom I can discuss sleeping patterns and breastfeeding issues with. Everything in moderation, I suppose. It's interesting to note all of the differences between the two cultures, regardless of which end of the spectrum you fall on. Soren had his first day of daycare yesterday! It went really, really well. He was the only baby there (only one other little girl goes there now), and the daycare woman told us over and over again how sweet he was. He slept, ate, played, and went to the park. When Tyler picked him up at the end of the day, he cried! I don't think we could have hoped for anything better. I still feel a little badly about not spending every day with him, but if I can't be there with him at least I know he's having a good time. Thanks Amanda! I love reading books that make me think a little. It's so interesting to see things from someone else's perspective. Also - this totally makes me want to move to France for a year or two!